New Rochelle, NY, June 27, 2018 — Nursing mothers who live with two or more smokers are more likely to stop breastfeeding sooner than those who live in nonsmoking households. In a Hong Kong-based study, researchers discovered that these mothers are at 30 percent higher risk for ending breastfeeding before a year. This study can be found in Breastfeeding Medicine, a peer-reviewed publication from Mary Ann Liebert, Inc., publishers. The article is available free on the Breastfeeding Medicine website. The study entitled, "The Effects of Secondary Cigarette Smoke from Household Members on Breastfeeding Duration: A Prospective Cohort Study," examines a cohort of 1,277 mother and baby pairs from four major hospitals in Hong Kong. Coauthors Kris Lok, Man Ping Wang, and Vincci Chan of the University of Hong Kong School of Nursing and Marie Tarrant of the University of British Columbia School of Nursing use self-reported questionnaires to collect demographic data, parental smoking habits, and other variable data. Researchers followed up with participants with a phone interview at 12 months or when they had finished breastfeeding. The study comes during a city-wide push to decrease smoking rates and increase breastfeeding duration. "Once again we are reminded that cigarette smoking is not only dangerous to your health but also to the most vulnerable members of your household," says Arthur I. Eidelman, MD, Editor-in-Chief of Breastfeeding Medicine. The Academy of Breastfeeding Medicine is a worldwide organization of medical doctors dedicated to the promotion, protection, and support of breastfeeding. For over 20 years, ABM has been bringing doctors together to provide evidence-based solutions to the challenges facing breastfeeding across the globe. A vast body of research has demonstrated significant nutritional, physiological, and psychological benefits for both mothers and children that last well beyond infancy. But while breastfeeding is the foundation of a lifetime of health and wellbeing, clinical practice lags behind scientific evidence. Since its founding in 1993, ABM has been building a global community of medical doctors with diverse backgrounds, experiences, perspectives, and specialties. 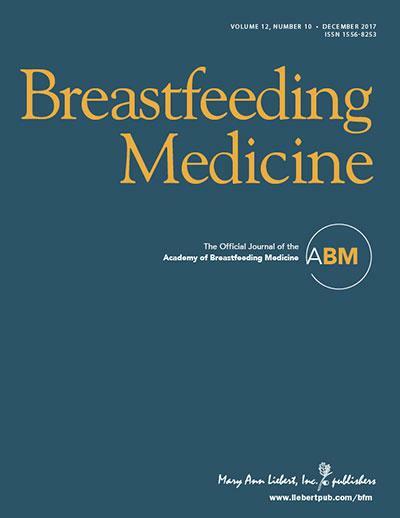 Through its worldwide membership, peer-reviewed journal, Fellowship in Breastfeeding Medicine, Annual International Meeting, and partnerships with other organizations, ABM has created a network of experts and advocates to drive medicine forward in this crucial area. By building on our legacy of research into this field and sharing it with the broader medical community, we can overcome barriers, influence health policies, and change behaviors. Mary Ann Liebert, Inc., publishers is a privately held, fully integrated media company known for establishing authoritative peer-reviewed journals in many promising areas of science and biomedical research, including Journal of Women's Health, Childhood Obesity, and Pediatric Allergy, Immunology, and Pulmonology. Its biotechnology trade magazine, GEN (Genetic Engineering & Biotechnology News) was the first in its field and is today the industry's most widely read publication worldwide. A complete list of the firm's 80 journals, books, and newsmagazines is available on the Mary Ann Liebert, Inc., publishers website.